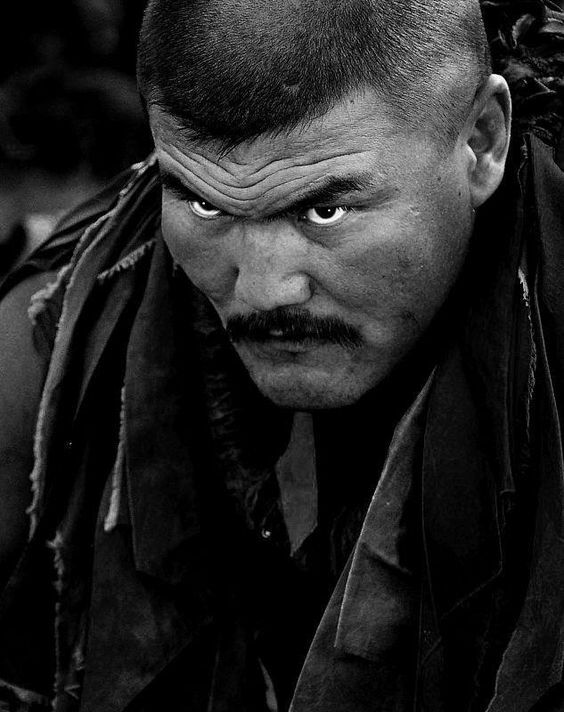 The Mongols recognised three Manly Skills: horsemanship, archery, and wrestling. Of the three, it was wrestling which provided the purest test of Manliness. The wrestler has no horse or bow to help him, or to take the blame for his failure. He stands nearly naked, with nothing to rely upon except his own strength, skill, agility, and guile. Here's how it works: two men dance towards each other, their movements imitating the motions of birds or tigers, in the hope of calling the qualities of the chosen animal down into their body during the struggle ahead. Then they grab for one another and attempt to pull each other down. No punching, kicking, or throttling is permitted; just grips and holds, trips and throws. The loser is the first one to be forced to touch the ground with any part of his body other than his feet. There are no time limits. Matches can go on for hours. The existence of Mongolian wrestling is handy for ATWC, because it gives an easy excuse for non-lethal physical confrontations. If someone insults you, or humiliates you, or makes a pass at your boy- or girlfriend, there's no need for guns or swords to be drawn: just challenge them to a wrestling bout, and prove in front of everyone that you're more Manly than they could ever be. Because the rules are so simple, and so universally regarded as an authentic test of Manliness, there's no reason why even a random encounter in the middle of the steppe (or, indeed, the middle of a dungeon) shouldn't be resolved by a wrestling match rather than actual combat. Two groups of heavily armed strangers encounter one another, point guns at each other, trade insults... and then their leaders step forwards, strip off, and wrestle, with the loser's group ceding ground to the winner in recognition of his superior Manliness. Courage is proven and worth tested without anyone having to get their brains splattered all over the floor. For this to work, it's important to emphasise that virtually everyone in the steppe regions (and for hundreds of miles around them) is a massive wrestling fan. That Pig Man you just encountered in a cave someplace? Totally up for a wrestling match. That ancient clockwork warrior you just accidentally reactivated in some half-fallen ruin? You bet he'd be willing to wrestle you! There are limits, of course - drop into your best wrestling stance in front of the Secret Police and they'll just shoot your kneecaps off - but, in general, wrestling is everyone's go-to form of non-lethal conflict. Your PCs should totally be getting into wrestling matches all the time. Besides, it gives them an excuse to take their clothes off. Every romance narrative needs an excuse for gratuitous male toplessness. Your basic Wrestling Rating is equal to the sum of your Strength bonus, your Dexterity bonus, and the melee to-hit bonus granted by your class level. Example: A 3rd-level fighter (to-hit +3) with Strength 13 (strength bonus +1) and Dexterity 11 (dexterity bonus 0) has a base Wrestling Rating of 4. If you're a trained wrestler (as most inhabitants of the steppes will be), add an extra +1 to your Wrestling Rating. If you actually spend a substantial chunk of your life practising and working on your wrestling technique, this bonus rises to +2. If you've had a chance to study your opponent's technique, either from wrestling them before or carefully watching them wrestle someone else, you can add your Wisdom bonus (if any) to your Wrestling Rating. If you are substantially larger and heavier than your opponent, add +1 to your Wrestling Rating. 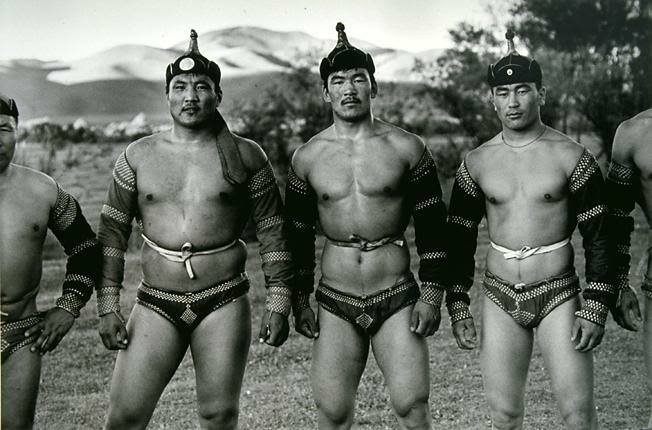 In traditional Mongolian wrestling, it is expected and encouraged that each wrestler's best friend should stand just a couple of feet away from them, yelling advice and encouragement and dispensing all-purpose smack talk to the audience. If your supporter (called a zasuul) has a positive Charisma or Wisdom bonus, you may add an extra +1 to your Wrestling Rating. To resolve a wrestling bout, each wrestler rolls 1d6 and adds their Wrestling Rating. If one wrestler beats the other's score by 3 or more points, then they score a quick victory and their opponent goes down within minutes. If not, then the match goes long. Each wrestler adds their Constitution bonuses to their Wrestling Rating, to represent the importance of stamina in the long bout, and unless the initial rolls were tied, the loser reduces their Wrestling Rating by 1, to represent their dented confidence from getting the worse of the initial exchange. Each then rolls 1d6 a second time and adds their modified Rating. Highest score wins: the larger the difference between the scores, the quicker the victory. A tie indicates a draw, probably because someone bungled a throw and ended up hitting the ground at the same time as their opponent. In a wrestling match, wrestlers always get the full +2 bonus to their Wrestling Rating for training and experience. When serving as someone else's zasuul in a wrestling match, wrestlers can grant them an additional +1 bonus by shouting specialist advice on how they can best defeat their opponent. In any fight in which a wrestler wears light armour (chain shirt and lighter) and is able to spend at least one minute immediately before battle doing his warm-up dance, he receives a +1 bonus to AC and REF saves for the duration of the battle. These abilities replace the battlefield first aid ability of the regular fighter.